Planning on getting married soon, but you do not want a white wedding dress. Looking for a colorful wedding gown to wear? There is so many different dresses you can choose from. Tired of going by the old fashion rules that every woman should be wearing a white dress when getting married. I feel the same way about this. I am not going to get married in a white dress. I do not feel as though if I do not I would be breaking any kind of marriage rules or want not. My theory is if it is your wedding you plan it out any way that you want and what ever is going to bring a smile to your face then do it. It is no one else decision on what you are to wear or how you are to put your wedding together. Below I am going to show you a few shots of different colored wedding dresses that are quite beautiful. 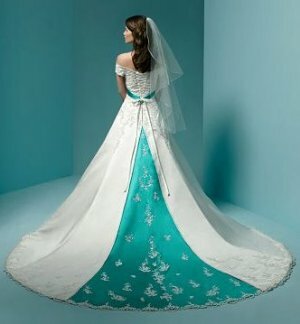 This is an image of a wedding dress that is white with turquoise pattern on it. This dress is still mostly white but the added color on the train really makes it stand out form plain white white dresses. 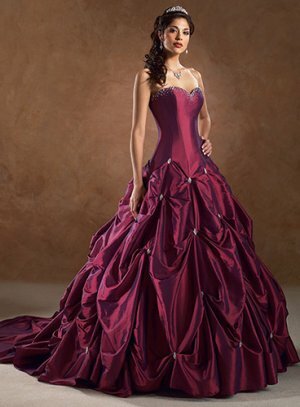 This is an image of a a maroon colored princess wedding dress with silver diamonds on it. This wedding dress is perfect for an elegant night wedding. 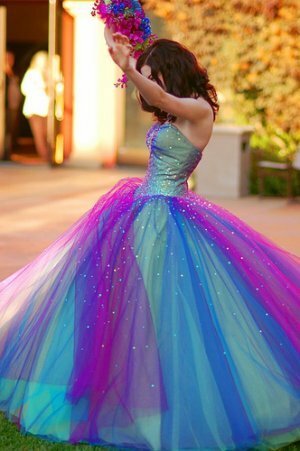 This is an image of a multi-colored wedding gown. It has blue, pink, purple and silver glitter on it. This dress is perfect for a bride that wants to feel like a Fairy Princess at her wedding. This is an image of a bright yellow wedding dress that is tightly fitted with flowers at the top and side of it. If you loved Beauty and the Beast as a little girl this dress will surely make you feel like the Belle of your wedding. If you are looking to spice your wedding up then try going for a dress with some color to it. You will be the center of attention even more then you already are. The one thing you want to remember though is make sure that the colors look good on you first. Wedding dresses with color | Have you been looking for the perfect wedding dress? Share a link to a page on Colorful Wedding Gowns and we will consider it for placement on this page.